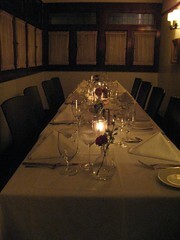 The Raymond, situated in a historic cottage built in 1901, is very much a part of Pasadena history. 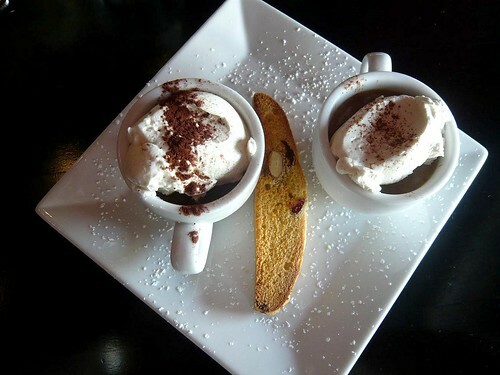 This intimate and charming restaurant has always been a Pasadena favorite for romantic dates and special occasions, but the forward looking management is aiming for a larger audience. 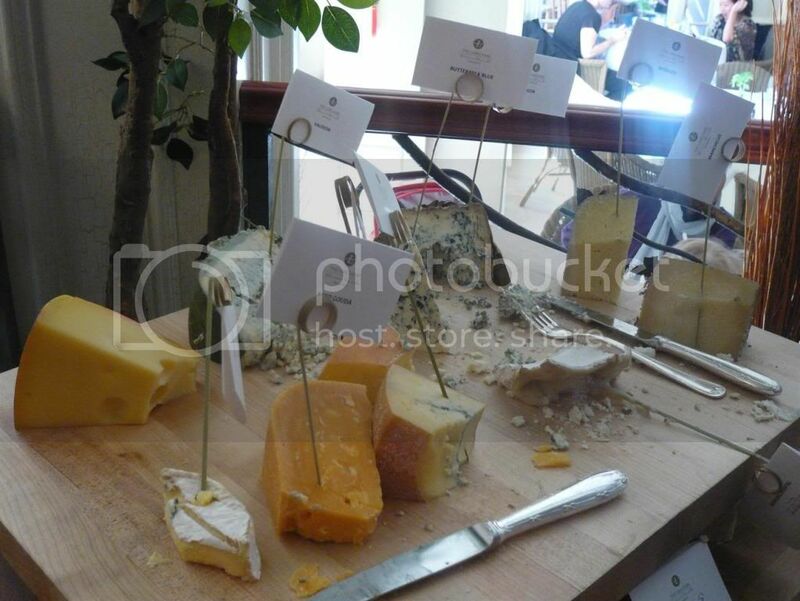 For this reason, they invited some bloggers for a private tasting. Even though it's right next to a major street, walking down to the restaurant transports you to old Pasadena, with a quiet and welcoming facade. Their new Executive Chef, Tim Guiltinan, is a Cordon Bleu graduate and had worked at various restaurants in the Orange County including as chef de cuisine at Leatherby's Cafe Rouge under Mark Gold (now of Eva). Guiltinan has been heading the kitchen for 1 1/2 years. 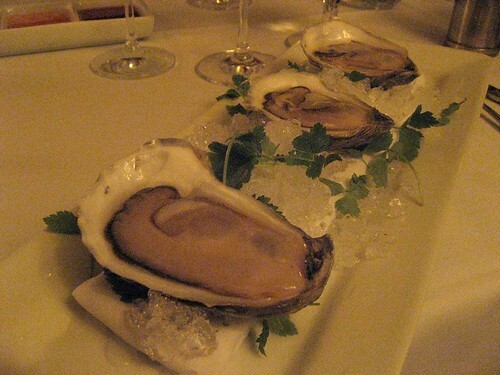 Our multi course meal started out with three Island Creek Oysters, harvested 2 days ago. The szechuan and habanero sauces luckily weren't too spicy although they did have a teeny kick to them. My favorite was easily the mignonette and I think many of us agreed. 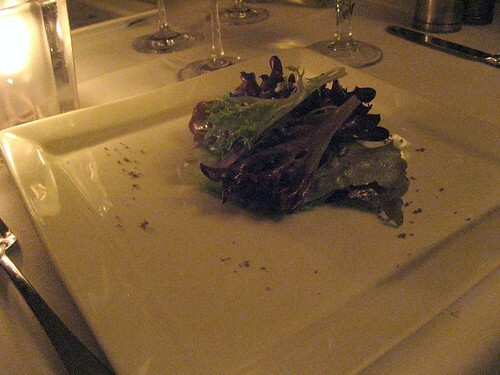 Next was a simple salad of locally grown lettuce tossed in lemon vinaigrette and garnished with smoked salt. The lettuce was very fresh and definitely showed superiority of sourcing it locally, though the salad itself was perhaps too simple for a tasting menu such as this. 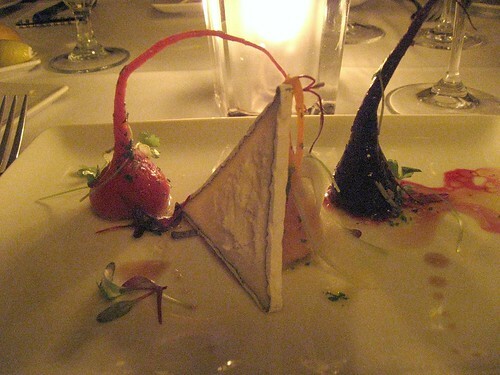 The third course was Heirloom beets with Cypress Grove goat cheese, paired with Arneis from Piemonte, Italy. The wine is minerally by itself but the beet and cheese bring out the fruitiness, making this one of the more memorable pairings of the night. Sea bream (a.k.a. 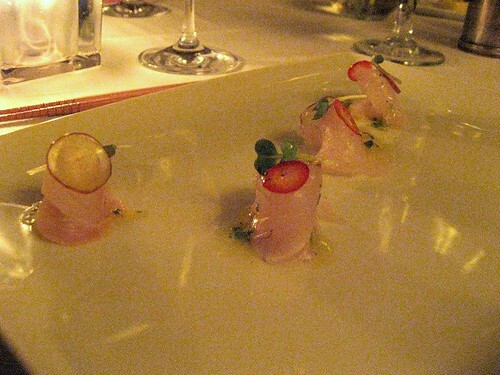 tai snapper) with lime vinaigrette, diced chile, and Australian Marie river salt. This was a little spicy for my weak tongue, though I can still handle it. The sea bream was fresh but perhaps could use a little more salt. 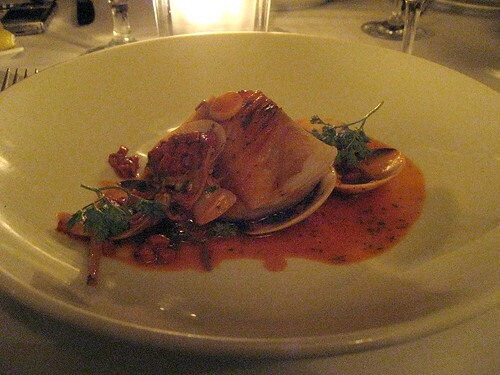 Sable fish (cod fish) from Canada (harvested yesterday), piquillo, Venus clams. Paired with Ramey Chardonnay from the Russian River valley. Guiltinan sources a lot of his seafood from "his guy" in Canada and manages to get very fresh seafood. The cod fish had a crispy outer layer and a nice kick from the chorizo. Paired well with the chardonnay, so far this is my favorite. Deep water scallop from Canada with house grown basil, black trumpet mushrooms from Oregon. Paired with 2007 Porter bass Chardonnay from Sonoma coast. 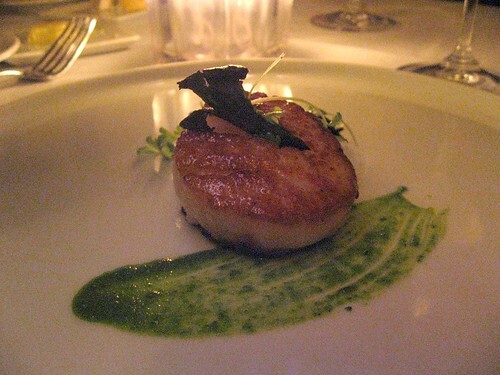 The scallop had a lovely texture and a nice subtle flavor that's not overwhelmed by the sauce and accompaniments. 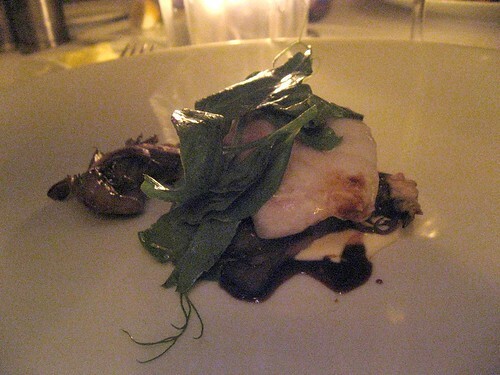 New Zealand John Dory with soy and sweet pea and maitake mushroom. Paired with 2007 Sonoma Coast Flower Pinot Noir. Another well cooked fish with a nice texture, this dish had great flavors and I particularly liked the sweet pea and the mushrooms. American wagyu medallion from Idaho. Served with Potato emulsion with jus, soy caviar. Paired with 2006 Napa Valley Chappellet Merlot Cabernet Sauvignon. The wagyu was amazing and cooked perfectly. Very tender and flavorful. The dish easily became my favorite of the night and as far as my memory serves me, this was better than my experience with CUT's American wagyu. 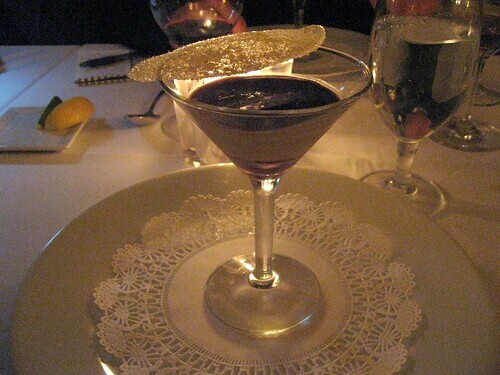 Our dessert was layered in a martini glass: Butterscotch topped with panna cotta, popcorn tuile, blueberry compote. I'm not sure if the layers work here. As a dessert it was overall too salty/buttery for my taste. 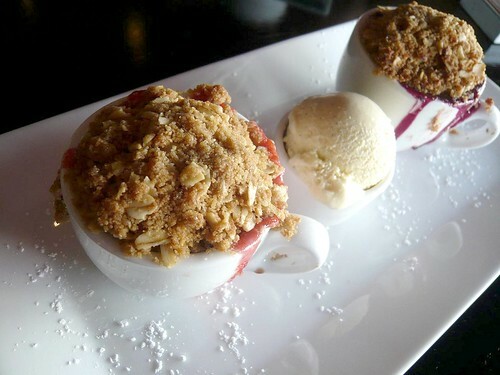 I crave something sweeter to finish off my meals. I did like the fact that the dessert was paired with scotch however, since it is unusual and complements dessert better than sweet wines in my opinion as it cuts the sweetness (though the sweetness is lacking in this dessert). 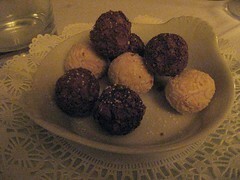 Luckily they did serve these chocolate truffles after. 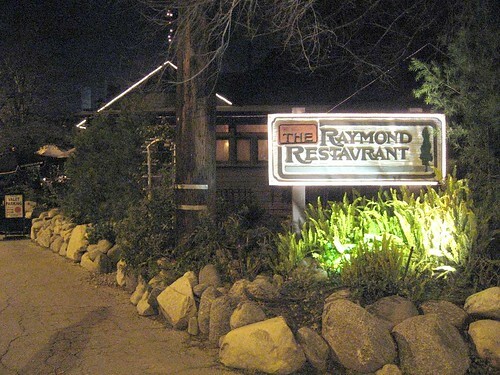 The Raymond is a special place for the Pasadena community for its history as both an architectural landmark and a long-standing (30 years) fine dining establishment. With the new management and new executive chef, they bring in high quality ingredients and infuse playful touches in their classic dishes. While some dishes still seem to be lacking, yet others I found to be great and a couple of brilliant dishes have me looking forward to what they have in store for the future. PS. The Raymond has donated a $100 gift certificate to Bid and Eat for Haiti, so if you want to check out the place, why not bid on it? 100% proceeds go to charity! Bid and Eat for Haiti is Back! Thank you for all who supported the first Bid and Eat for Haiti! We received more donation from restaurants after the end of the first auction, so we’re holding a second run! We raised $765 from the first auction, so let’s all help reach a goal of $1000, shall we? It’s the same basic deal, just with different dates and auction items. The auction benefits two charities: CHF International and Operation USA. More details about these charities can be found on the Bid and Eat website. This auction will start on Friday Feb 26, 2010 and runs until midnight of Tuesday Mar 2, 2010 , so you can only bid on items between those times! To bid, go on an item's page and leave a comment with your bid amount. Just go to http://bidandeat.wordpress.com to see the list of items. Even though there are only a few sponsors this time around, they have donated plenty of items (14 total! ), so do take a look and put in a bid! Food aside, this drive-in has been in business since 1966 and seems to be a local favorite. My cousin's friend took my aunt and I to San Jose to visit the Winchester mystery house and I was searching high and low for some good food, made more complicated by the fact that the friend was vegetarian. Luckily Kung Food Panda pointed this place out to me. 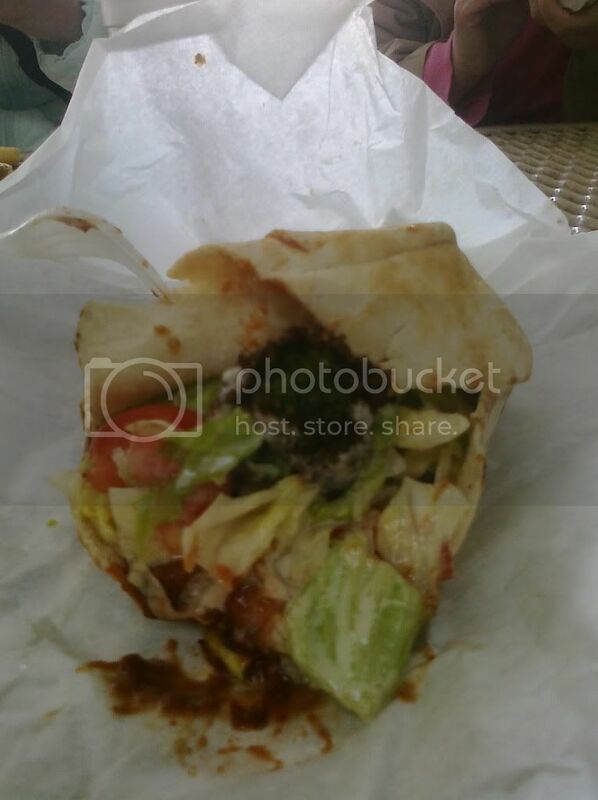 Get the $7 falafel and banana shake combo! he says. After going up stairs that lead to the ceiling, opening doors that open up to a 20 ft drop into the garden, standing in a seance room, we were ready for some good food. The place was pretty busy even in the late afternoon but the line wasn't too long and moves quickly. 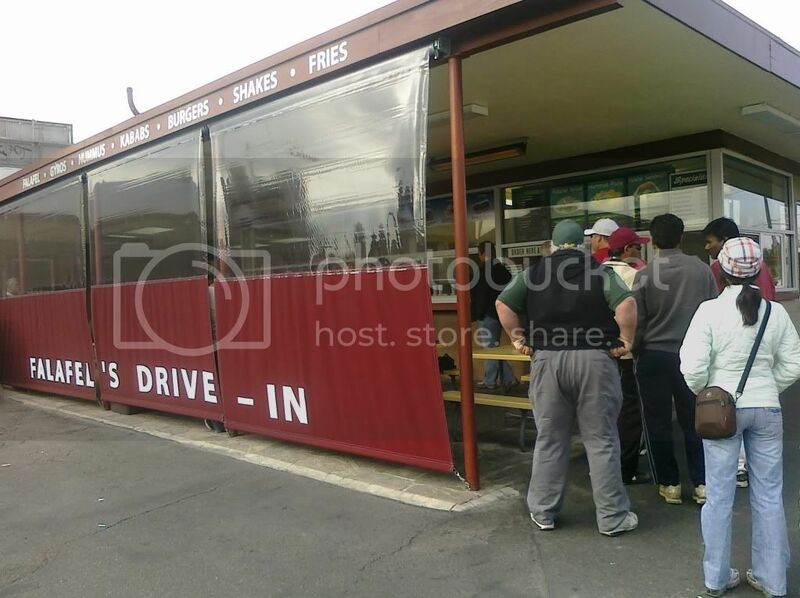 You line up, you order, and then you grab a seat next to the stand. Apparently the said falafel+banana shake combo is $7.50 now (KFP lieth!). It doesn't photograph well (especially with a camera phone) but trust me, it tastes way better than it may look. The crispiness of the falafel balls reveals a moist, green mixture of beans and spices. I have to first say that I haven't had too many falafels in my life, but based on my inexperienced falafel-palate, these were great. These along with fresh lettuce and a generous dollop of tahini +hot sauce are stuffed into a pita pocket. Extra containers of the sauces (hot sauce for you, tahini for me) are available by request and are recommended (just because they're so good). 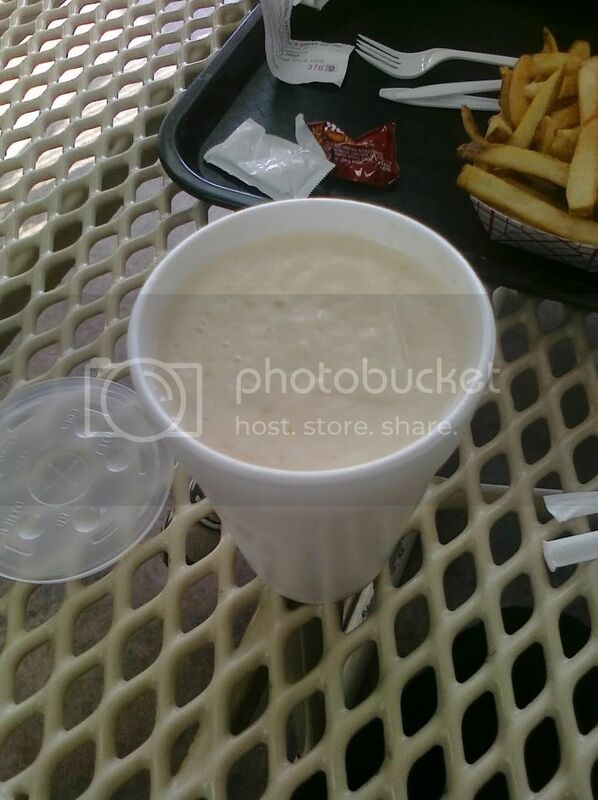 The banana shake in a large styrofoam cup had a lot of banana flavor and washed down the falafel quite well. Mind you it isn't particularly thick and wouldn't be the best banana shake you've ever had, but did you note that this and the falafel sandwich are only $7.50 total? 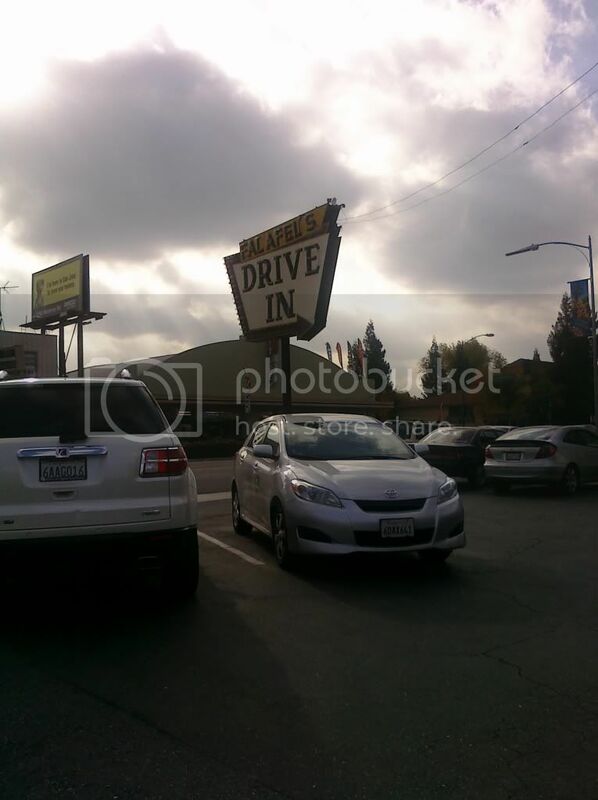 If you're in the San Jose area, you can't go wrong with Falafel Drive-In. In fact, if you're in the area, do make a point to stop by. I somehow managed to move my night out with the Cybernetics boys away from our usual Barro's. Even if they were 45 minutes late. I was holding the table drinking a whole pitcher of barley tea while people were waiting in line, and on top of that I used a $25 gift certificate. Ham Ji Park must hate me now. There's a grill on the table but looks like they don't really use it anymore. 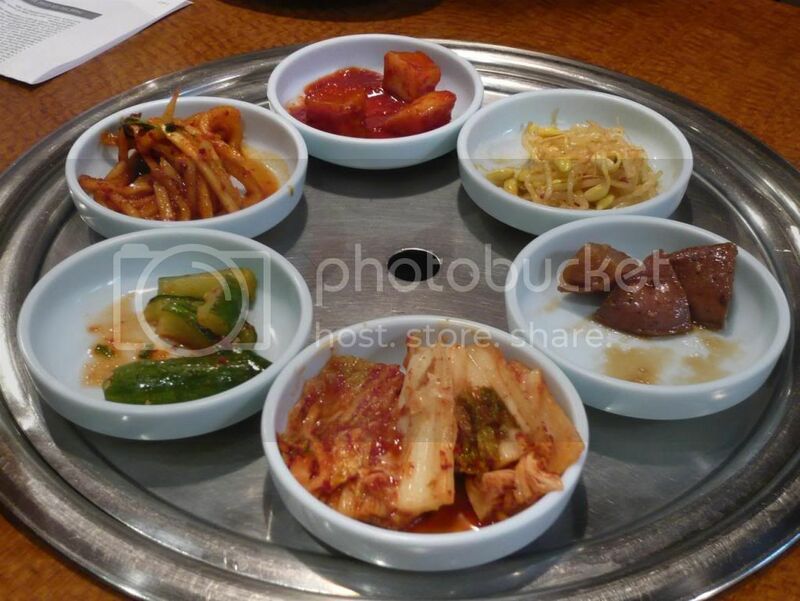 They covered ours with the banchan (my faves: marinated potato, bean sprouts, cucumber - the non spicy stuff, you know). This is also the dish that puts Ham Ji Park on the map. 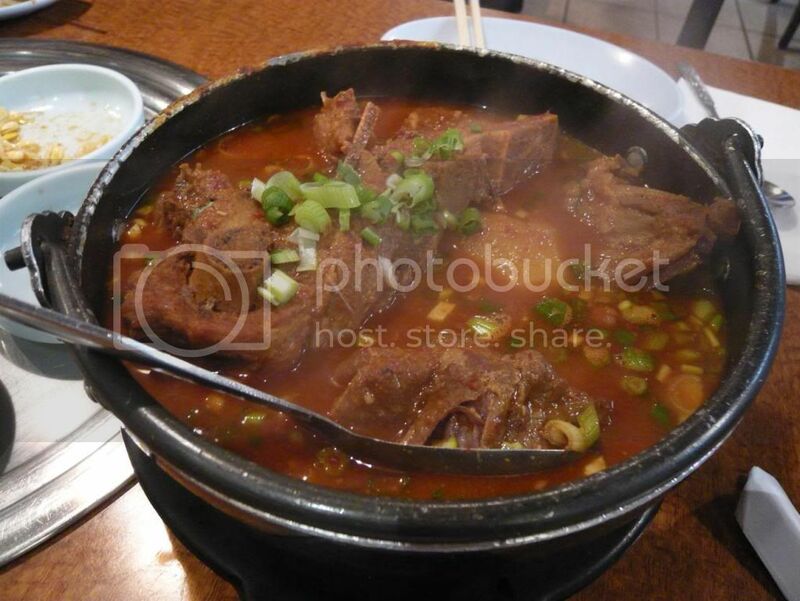 The stew of pork neck and potato is served in a stone pot and is big enough to feed two or three people. The meat was fall-off-the-bone tender and the broth packs a lot of the gochujang flavor. Serve this over a bowl of rice and I'm good. 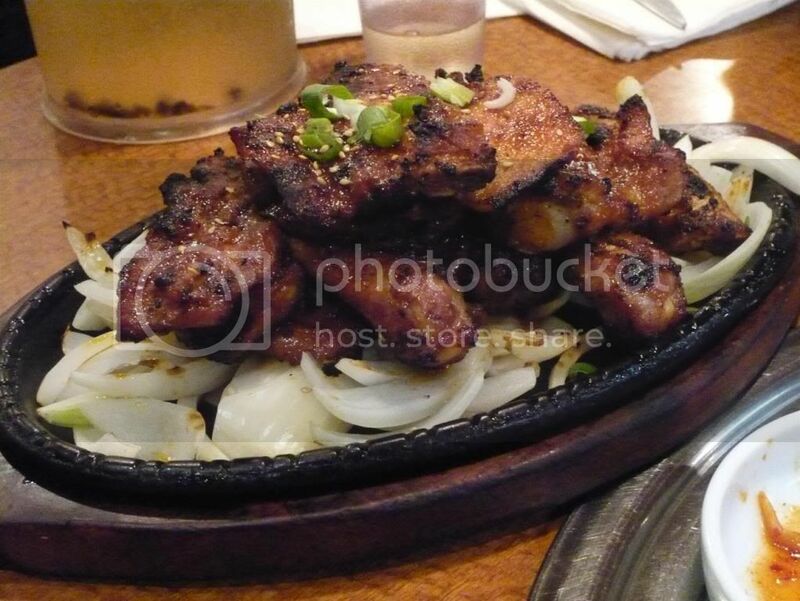 You can also order some marinated pork ribs ($16.99) which are sweet and tender. You don't grill the ribs yourselves but instead they're served on a sizzling plate. Ham Ji Park serves a solid and satisfying meal, especially for the pork lovers. If you're not so much into pork, I also recommend the spicy squid with noodles. After the restaurant.com gc, including tax and tips we each paid up $9. Sweet. 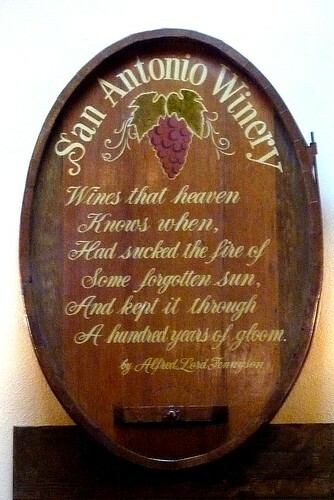 Back in July I discovered Los Angeles' last remaining winery, San Antonio Winery in downtown LA. Since they now have a wine tasting seminar series, they invited me to check out the first one, Wine 101. 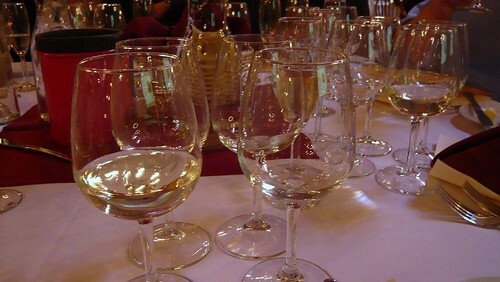 The tasting seminar involves a 4-course luncheon paired with eight different wines. The seminar is led by Michael Papalia, their wine Store manager. He first went over the basic steps of wine tasting (the look, swirl, sniff, slurp, etc). The afternoon started out with a plate of Puma goat cheese, orange and roasted eggplant salad (french vanilla glaze, basil oil and microgreens), paired with Champagne Duval-Leroy Brut, a nice champagne for $30 a bottle. 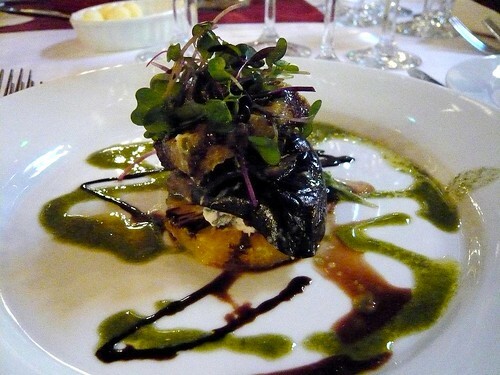 Nice contrast between the citrus and the creaminess of the eggplant and goat cheese. The cheese was not overwhelming either, but the eggplant was a little cold. 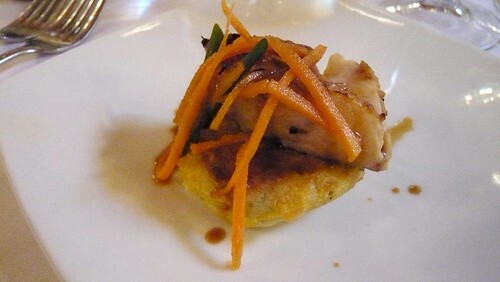 The next course was broiled miso Alaskan black cod on potato and chive pancake with miso glaze. This was a bit tough, a little overcooked, but it had nice flavors. I also liked the pancake quite a bit but the dish overall lacked texture. This was "paired" with 3 different whites for our comparison. The first two were the Frog's Leap 2008 Sauvignon Blanc(Napa Valley) and San Simeon 2006 Chardonnay(Monterey), a good pick for a Wine 101 course since the attendees can distinguish between the crispness of the Sauvignon Blanc and the buttery Chardonnay. The third wine was also informatively different with the Maddalena Vineyard 2008 Riesling, Monterey - this was a sweet, almost dessert-wine-like Riesling which I enjoyed in itself though not so much with the cod. I actually saved half of my glass and had it with my dessert later on (a better pairing, IMHO). 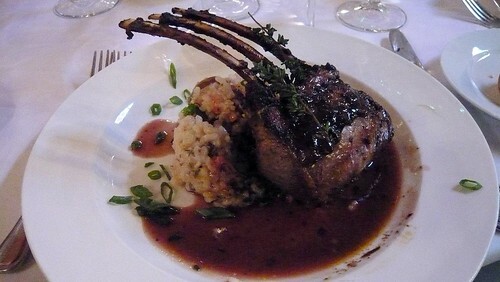 This was very good, the lamb was very tender if a bit fatty and very flavorful. 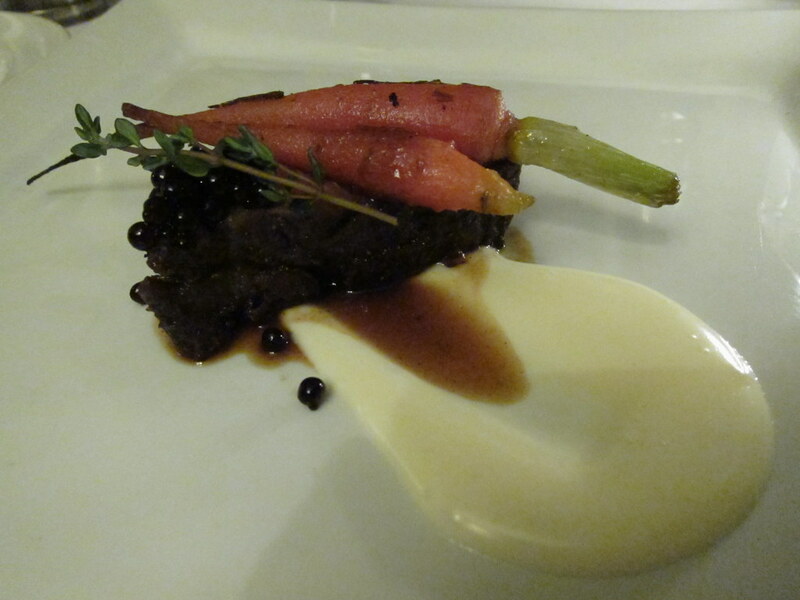 A great dish, one unexpectedly good considering I was just at a wine tasting seminar at a winery. 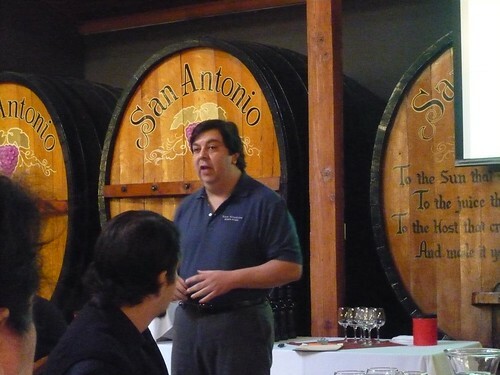 According to San Antonio Winery's owner, they bring in an outside chefs to prepare the food for these special tasting events and they intend to keep doing so for more improvement and to keep it interesting. The lamb chop was paired with three reds. The 2006 Luigi Bosca Malbec was a table favorite, though I think this wine would be better after aging a little longer. It does, however, pair nicely with the lamb chop. San Antonio “Cask 520″, Paso Robles. This was a pretty good wine, and definitely one of San Antonio's best wines and a good buy at $28. 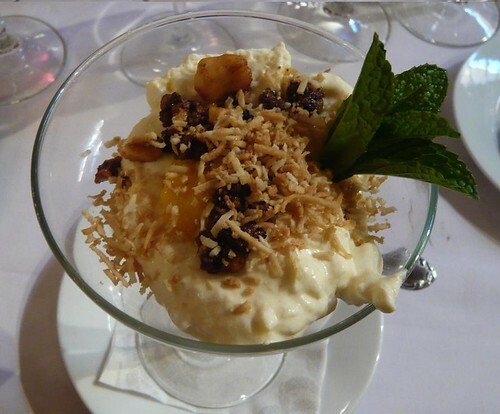 It was a simple dessert but I liked it a lot, especially with the nice aroma from the toasted coconuts and the texture of the candid macadamia. The La Quinta Syrah Port that was paired with the dessert was a bit too syrupy and sweet for my taste and I thought the Riesling from earlier was a better pairing. Papalia of course explained the process of making port, in particular brandy fortified port. If you're a wine newbie you will definitely learn a lot from this seminar, from the difference in the process between white and red wines, why chardonnay tends to be more buttery, and much more. Did you know that an oak barrel is individually hand crafted and runs about $1000 and can only be used for 2, or at most 3 vintages? Of course, you can then use them to age distilled spirits after, but still now I can understand more why wines can be so expensive. If you're interested in attending a tasting seminar at San Antonio Winery, here's their list of events. Wine 102: Exploring California's Grape Growing Regions. Sunday, Feb 21 (1-4 pm). $55, 4 course luncheon included. $60, 4 course luncheon included. Cube was the place I wanted to hit the most for this year's first Dine LA Restaurant Week, in particular their lunch. The Cube Truffle burger, available only on the lunch dine LA menu plus the fact that the three course meal ran only $22.00 per person led me to take an "extended lunch" with Wandering Chopsticks, since, alas, it was not open for lunch on Sundays. 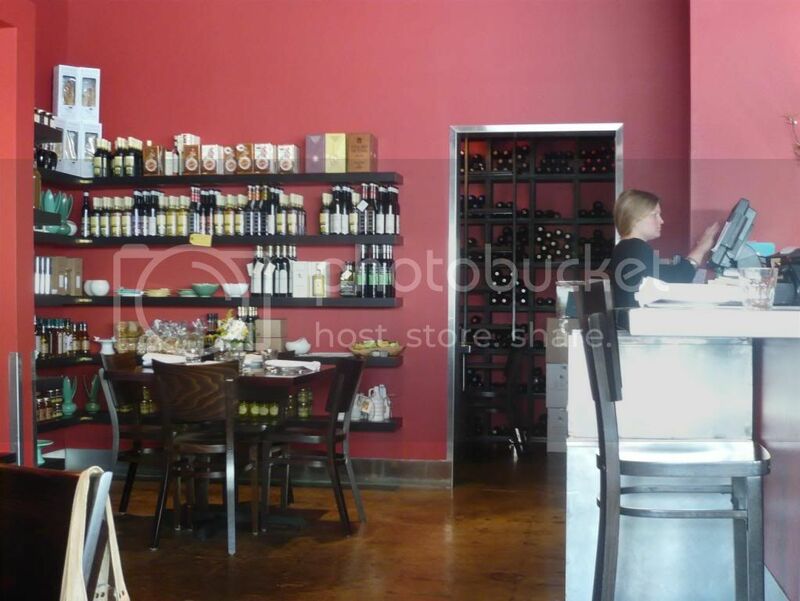 If you didn't catch it the first time, the place is called Cube Marketplace & Cafe, so of course they sell various gourmet, artisan food products, along with cute kitchen and table wares and $50 bowls. The Dine LA menu had three choices for both appetizer and entree, but WC and I wanted the same thing and didn't want to risk sharing something we might not want, so we both placed the same orders. They didn't even cut down on the portion. 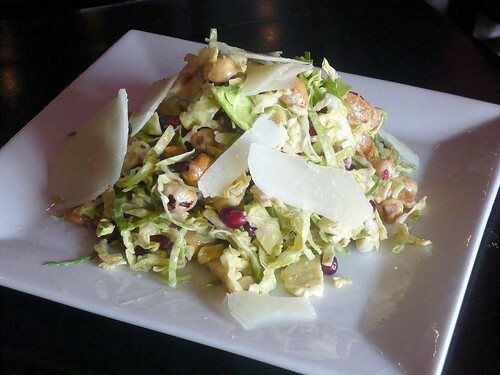 This plate of salad would've satisfied me until dinner time, but I had to trek on. The citrusy combination of the satsumas, pomegranates, and vinaigrette is a bit acidic, though the toasted hazelnuts balanced that off quite nicely and each bite was at once crunchy and refreshing. 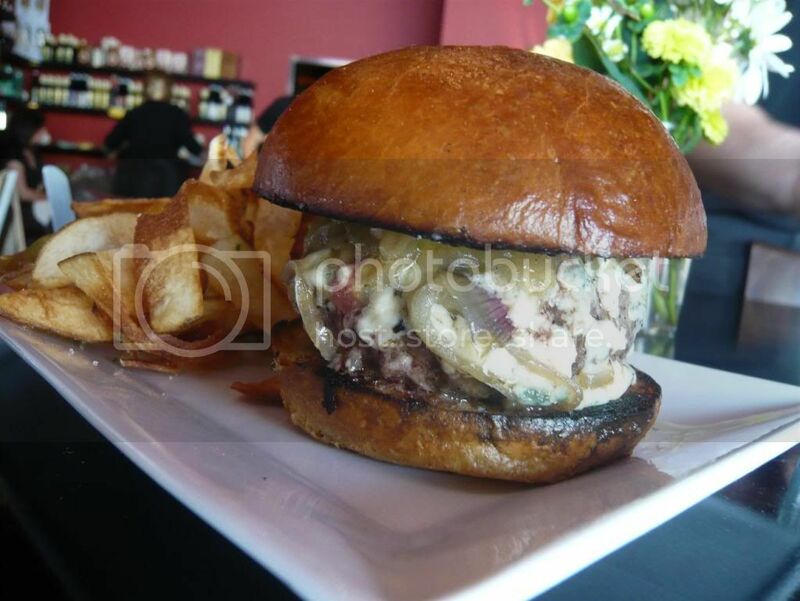 Moving on: Cube Truffle Burger (house brioche, blue cheese, caramelized shallots, crispy potatoes w/ chipotle ketchup on the side) - regularly $15. Arugula and tomato slices are provided on the side to build your burger to your liking. The brioche bun may be smaller in diameter, but it packs in one thick, juicy patty. While indulging in a slurry of meat juices amidst the strong aroma of blue cheese and truffle oil, you may feel the need to reach for a couple of the thin crisp fried potatoes dipped in the chipotle ketchup. And a couple more. In fact, if I didn't have a strong enough will to make them take away my plate I never would've stopped eating those crispy potatoes. Although all having all this great food had probably used up my good karma for the day, there was more to come. This time WC and I are actually sharing! The top is a thick granola-laden crust that fit my crust/fruit ratio preference just fine. Both were good, but the cherry in particular was amazing. Being a chocolate lover, I liked this dessert even more. The valrhona pot de creme is thick and dark. I loved the bittersweetness, although be warned that it might be darker than you may expect. 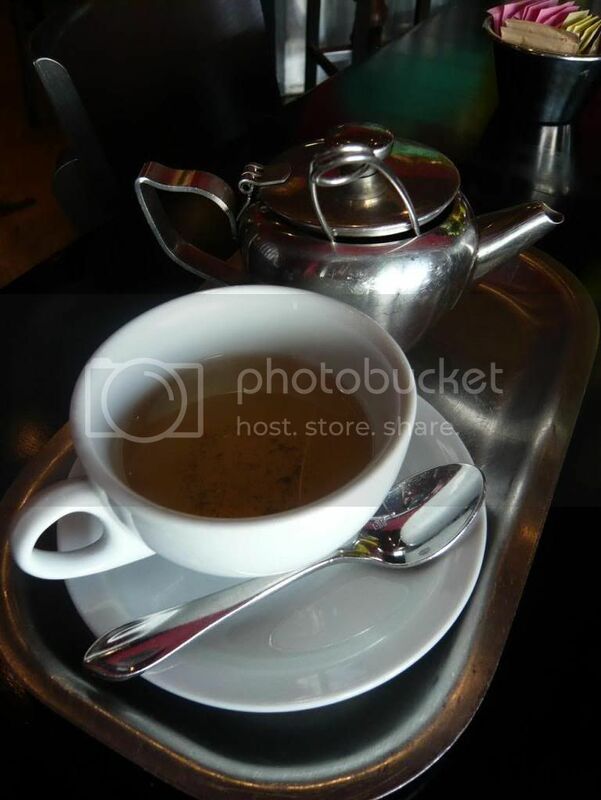 The desserts made me want some hot tea and since Cube does serve loose leaf tea, I ordered myself a pot. 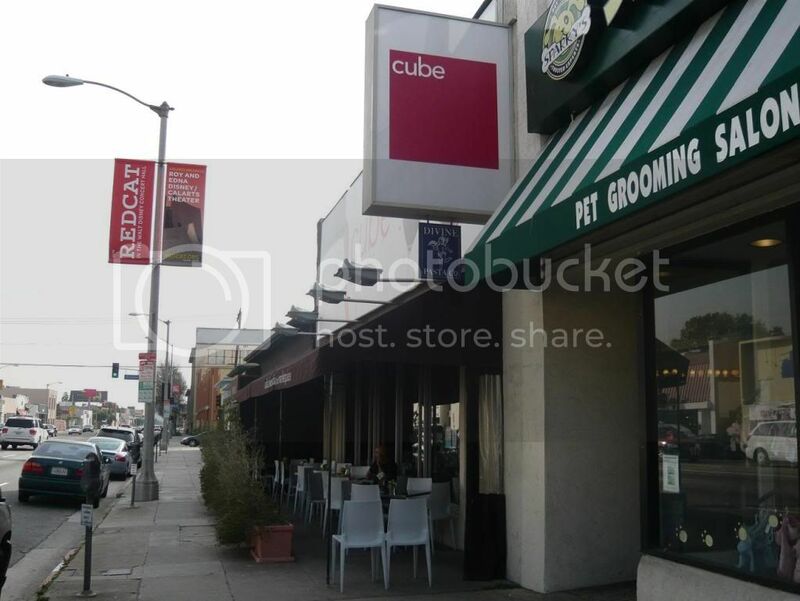 Cube's Dine LA lunch was an amazing deal. $11 salad + $15 burger + $8 dessert = $22, you do the Math (I'm just the bioengineer). Sorry I didn't tell you guys sooner ... hopefully they'll do it for the next Restaurant Week too. Even without it, though, Cube is definitely a place you should try. If you're a high-rolling Asian who frequents the San Gabriel Valley, you may be escorted to a table at a popular dim sum restaurant without waiting in line. If you're a high roller but don't have any pull in the SGV, you should consider the Sunday brunch buffet at The Terrace at The Langham for Chinese New Year. In celebration of Chinese New Year, for the month of February, The Terrace is offering a chinese inspired Sunday brunch buffet. Think dim sum, Peking duck, five spice duck, followed by almond pudding and egg tarts for dessert, amidst a white tablecloth dining room facing the swimming pool. 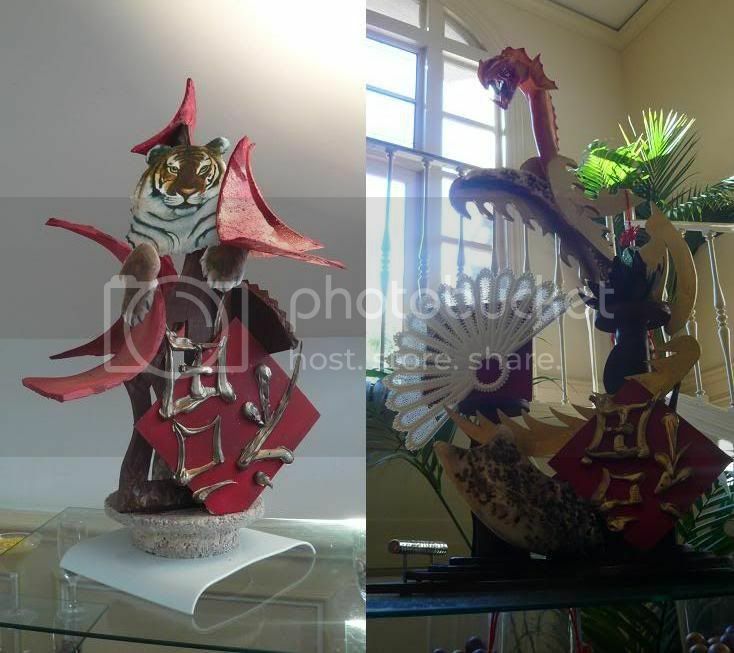 Walking down the stairs, you'd be hard pressed to miss the enticing dessert spread to your right, adorned with impressive chocolate sculptures celebrating the year of the Tiger with a sign for good fortune, and the ever-present symbol of the dragon. Dim sum station offering shrimp dumplings (har gow), shiu mai, and pork buns is set up next to a carving station boasting a whole Peking duck. I was pleasantly surprised by the shiu mai and pork buns, they tasted better than many dim sum places in the SGV! The har gow was quite good too although I prefer a thinner skin. The Peking duck was excellent, but I did miss the usual wrapping skin and green onion (they did have hoisin sauce) that I cannot separate peking duck from. It doesn't end there. There were also a cold section of creative Asian inspired dishes. My favorite was the smoked duck with black sesame sauce. The duck breast was flavorful and tender, but it was the unique black sesame sauce that lifted this dish. Besides the special Chinese food offering, you can find your expected Langham brunch buffet throughout the month, including the cold seafood spread: crab claws, oysters, and shrimp. 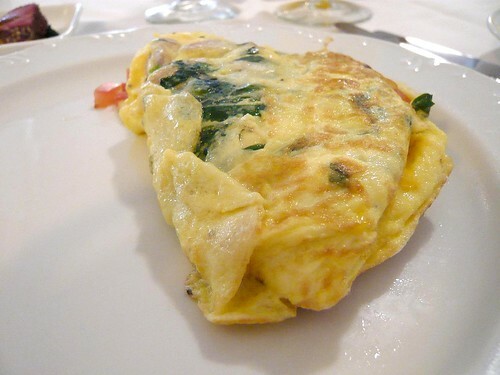 On the "br" section you'll find an omelette station spitting out very well prepared omelettes; choice of egg white available for that healthy adult in you. Pieces of salmon, yellowtail, tuna, and unagi nigiri sushi line the sushi station. At the other carving station, deliciously tender prime rib and lamb loin is available. If you can still fit more, don't miss this. The cheese tray is a nice selection of gouda, three blue cheeses, and more, along with a variety of condiments right next to it. 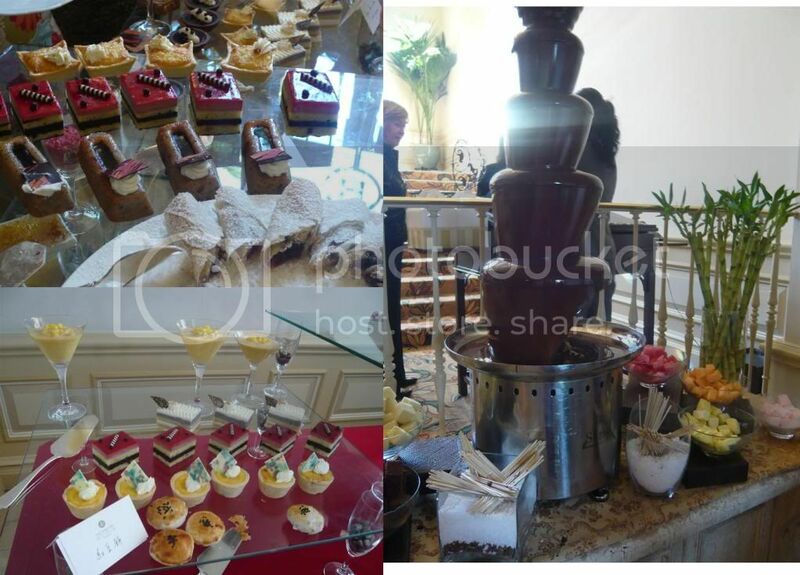 Last but not least of course, for us the sweet-toothed: the dessert stations. 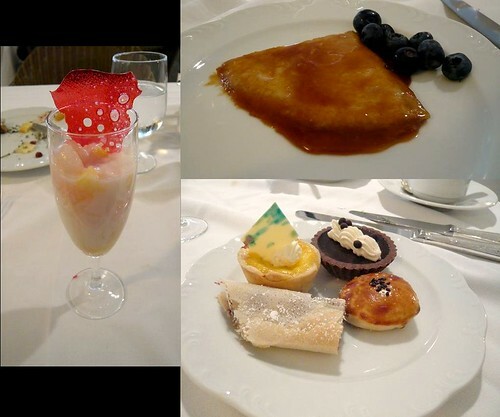 Petit fours, creme brulees, a Crêpes and waffle station, and a chocolate fountain. I was still surprised to find chinese desserts like almond tofu pudding, pia, and egg tarts here, alongside their usual layer cakes, chocolate tarts, and more. 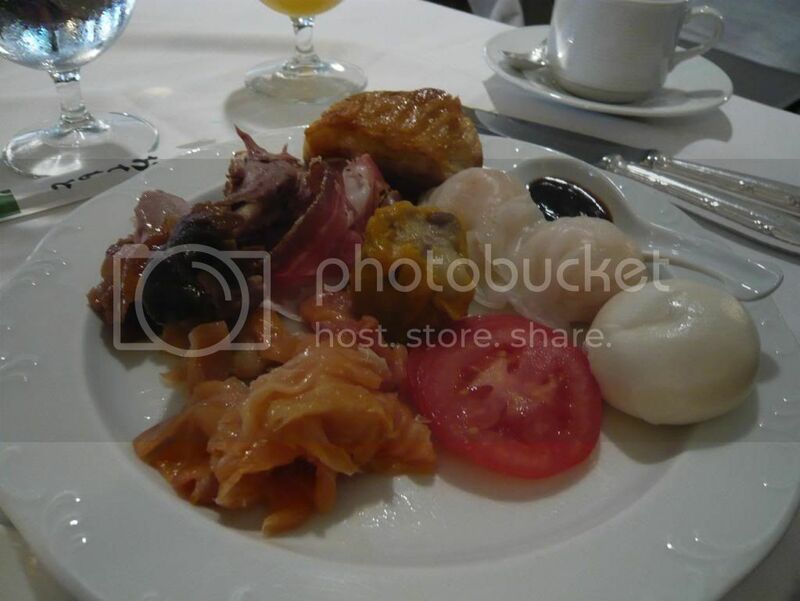 A $75 brunch buffet would certainly not involve food only. 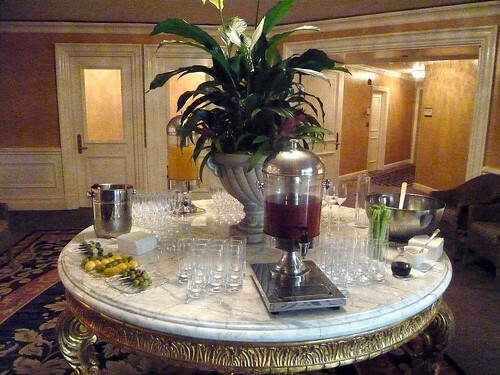 You can of course expect your usual mimosa or champagne flutes to remain full, but if you want to spice up your Sunday a bit, there's a build-your-own Bloody Mary bar just past the dessert station. Even though it's a buffet, The Langham spares no detail. With spot on service and delicious food (and champagne), my brunch was thoroughly enjoyable. Needless to say I wasn't even hungry until the next morning. The Langham does brunch right, why not indulge on Chinese New Year here? Oh, the valet is free too so forget fighting for parking spots outside of Elite. *Disclaimer: The Langham hosted me for brunch here so I can report their month-long chinese new year special menu (i.e. I ate for free, and boy, did I enjoy it).